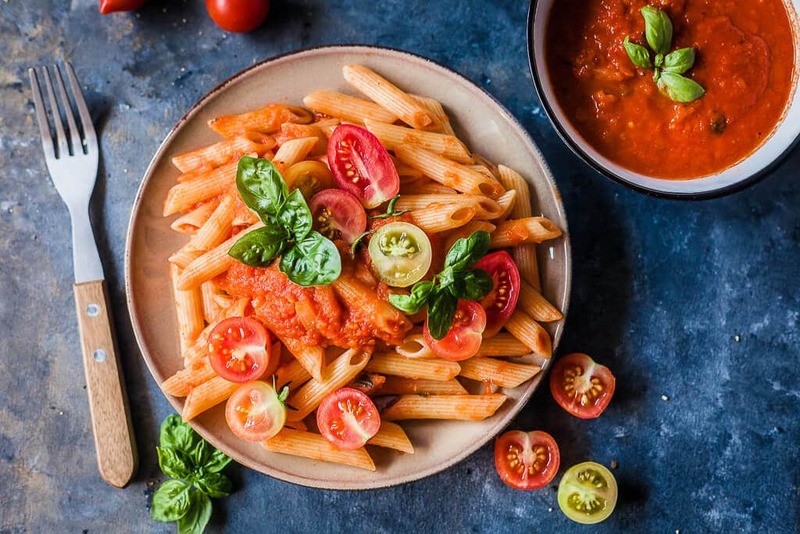 This simple Tomato Pasta Sauce is the perfect base for all your tomato recipes. Gluten-free and Vegan! There are probably as many tomato pasta sauce recipes, as there are cooks in the world. Each one swears by their own secret family recipe. Truth is, this is just about right. There is no right or perfect recipe. Each has their own taste. Sometimes you want to cook the sauce down and reduce it to a puree. Sometimes you just want something quick on the table. I guess it all comes down to the tomatoes you choose for your sauce. Not all tomatoes are great for the sauce. I always try to choose those tomatoes, that have plenty of flesh and little to none watery seeds. 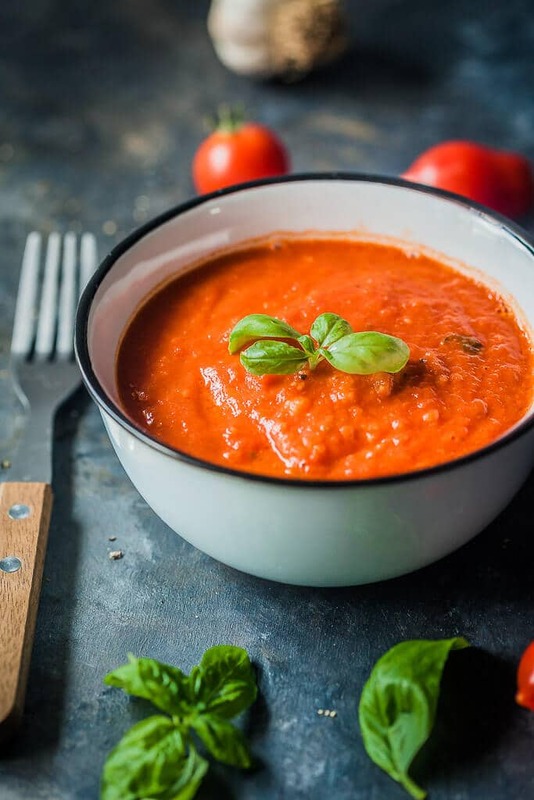 This Tomato Pasta Sauce is one of the quickest ways to make a great pasta sauce, in our opinion. Start by prepping your tomatoes. If you are lucky enough to have a food mill, you can avoid peeling tomatoes, otherwise, I strongly recommend you do peel them beforehand. 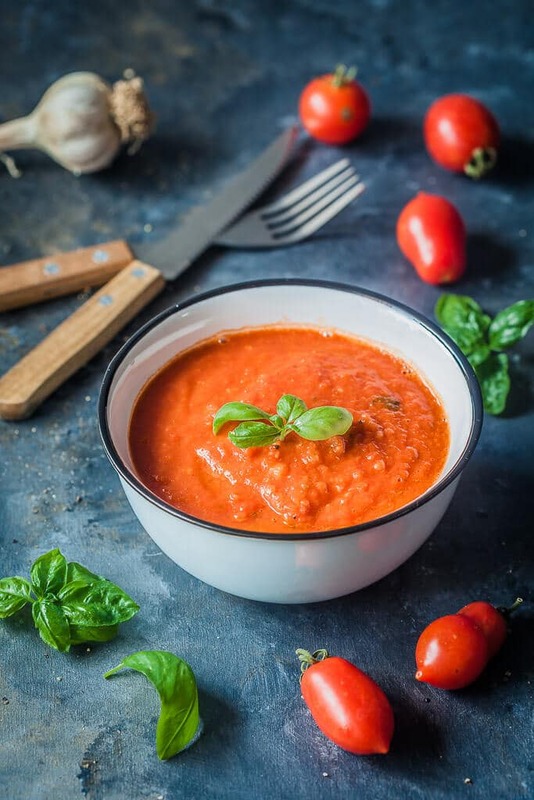 If your tomatoes are perfectly ripe you may be able to just peel them with a sharp knife and plenty of patience, otherwise, dunk the tomatoes in boiling hot water for a minute and immediately cool them down in cold water, then drain. We don’t want to cook them (just yet), but only let the skin part enough, for you to be able to peel your tomatoes. Then roughly slice them and remove the seeds and water. 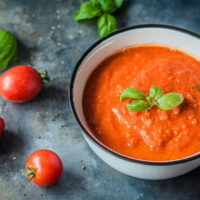 Slice onions and garlic, saute until translucent, then add your tomatoes and cook them until they soften enough to break down, and the sauce reduces and thickens. I usually cook them just about 15-20 minutes. I don’t want to overcook my tomatoes because the longer you cook them, the more nutrient they lose. 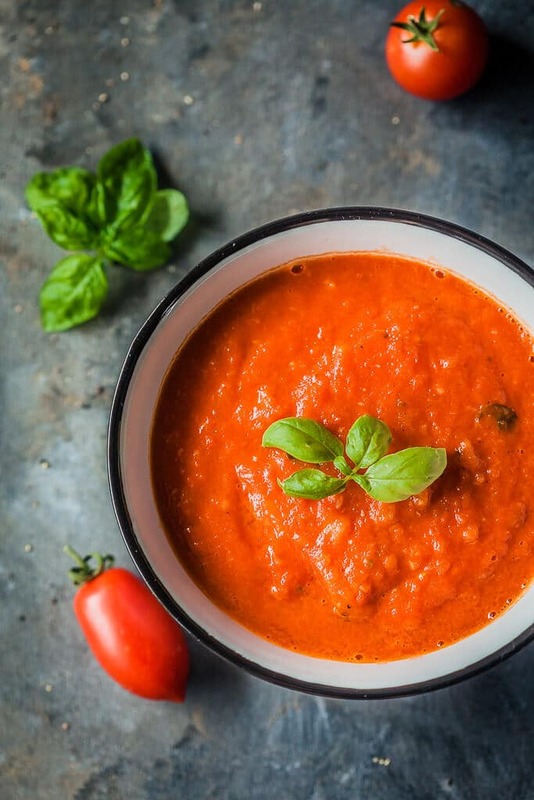 On the other hand, tomatoes are really healthy cooked, not raw, because cooking releases more lycopene, which acts as an antioxidant. Add some salt, pepper, some chopped basil leaves, then use a stick blender to blend your sauce as smooth as you like it. If by this point your sauce is still watery, cook it a bit longer, until it reduces more. Depending on how big a batch you want to cook, I usually just do about a kilo of tomatoes per batch, then whatever I don’t end up using immediately, I store in an air-tight container in the fridge for up to a week and use in other recipes. You can connect with us on our Instagram and Facebook or on Pinterest. We share many behind-the-scene photos in our Instagram Stories, so be sure to check it out! And don’t forget to sign up to our newsletter & stay up to date with our latest recipes!